To date, very little data has been available on the effect of biochar on temperate soils, especially for field trials in commercial farming operations. One of the pioneers to research and field-test biochar in Canada is BlueLeaf Inc. BlueLeaf set up a biochar commercial farm field trial in the spring of 2008 and has been intensively monitoring the plots for two growing seasons. In May 2008, BlueLeaf purchased biochar from the Canadian company DynaMotive Energy Systems Corporation and applied it to a clay soil in one swath. An adjacent, unamended swath was marked for comparison. The field had previously been managed conventionally with dairy cattle manure applications. 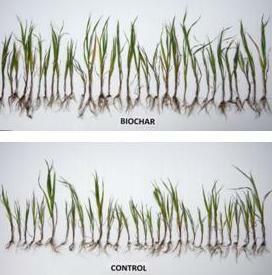 One of the questions the BlueLeaf team had was how to best work with and apply the biochar. The material provided by DynaMotive was produced through a fast pyrolysis process, resulting in very finely divided particles. 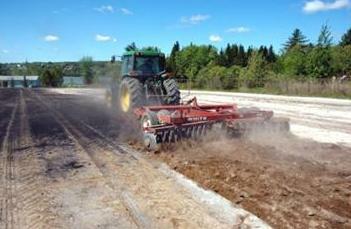 It was applied using a commercial lime spreader and losses by wind were significant. This was an important learning experience and points to the fact that finely divided biochars must either be processed after production (e.g. by pelletizing, prilling, wetting, etc. ), and/or best management practices must be developed for working with these fine biochars. In the Quebec region, application of biochar in a mixture with manure could potentially drastically reduce the losses of biochar during handling and application. New equipment being developed by the United States Department of Agriculture for the subsurface application of poultry litter could also prove to be useful in reducing biochar losses during application. The effect of biochar on soybean yields in the first season of the BlueLeaf field trial was positive, with a 19% yield increase when biochar was applied at an estimated rate of 3.9 t/ha. 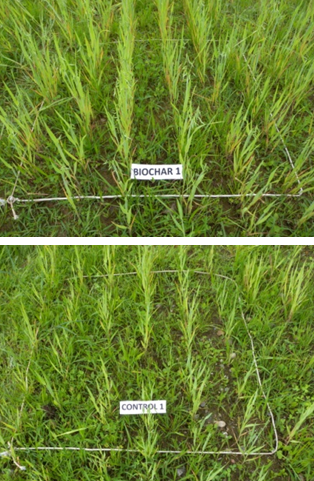 A mixture of annual and perennial forage species was seeded in 2009 and fresh above-ground biomass doubled where biochar had been applied compared to the unamended control. Although the yield improvements could not definitively be related to the availability of nutrients in soil, biochar did improve some physical and biological parameters of the soil such as increased earthworm density in biochar-amended plots. For a full report on this work, please go to: http://www.blue-leaf.ca/main-en/report_a3.php . In addition to continuing to monitor this experiment, BlueLeaf will undertake new trials in the spring of 2010 which will compare different biochar materials at different application rates and monitor more closely the effect of biochar on phosphorus dynamics in soil, with and without manure application. BlueLeaf’s vision for the future of the biochar industry would involve the pyrolysis of existing streams of agricultural and forestry biomass. Ideally this would be achieved through the use of small-scale, mobile pyrolysis equipment going to the source of the biomass, processing it on-site and leaving it for application to soils by the farm operators. BlueLeaf hopes to validate this concept as a business model by demonstrating and quantifying the economic advantages of biochar for agricultural purposes. They believe that large scale use of biochar relies on its adaptation by the agricultural industry and demonstrating its economic advantages is essential. In addition to the economic advantages for agriculture, BlueLeaf will continue to examine all potential environmental advantages to biochar in soils, including soil nutrient retention (thereby reducing surface water eutrophication, groundwater contamination, and nutrient input requirements) as well as soil greenhouse gas reductions. BlueLeaf will also examine potential positive effects of biochar on soil biodiversity. ***BlueLeaf does not promote or condone the use of any specific products, including any of those mentioned in this report. It has no commercial or contractual relations with any suppliers of products or other participants mentioned in this report. BlueLeaf makes no claims or warranties, specific or implied, concerning any products mentioned in this report and express no opinion as regards any such claims made by the manufacturers or distributors of such products.